Renowned Brisbane funtime outfit Regurgitator have today announced their latest project: a sugar-soaked record cooked up especially for kids! Having performed at a number of children’s events in recent years, the inimitable band have developed the kid’s music project Regurgitator’s Pogogo Show - a typically manic playground that careers between punk, hip-hop, funk, electro-pop and everything in between. The debut release - The Really Really Really Really Boring Album - is about as silly and cheeky as a record can get, whilst still offering a G-rating suitable for the tiny folk. Featuring instant-ear wriggles such as first single ‘The Box’, it’s sure to bring a smile to the faces of long-term fans as well as the young ones in their life. 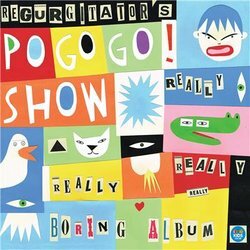 ‘The Box’ is the debut track from Regurgitator’s Pogogo Show – the brand new kids music project from legendary Australian innovators Regurgitator. It’s an ode to the timeless joy of getting creative and using your imagination!